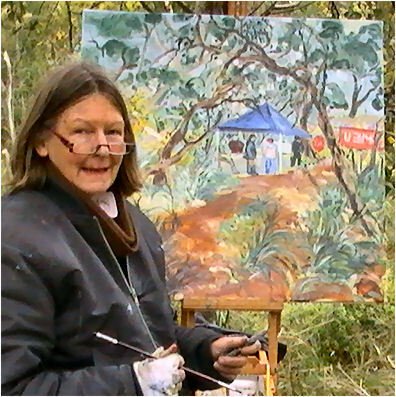 On 21 September 2010, Gillian Collins, who has led the defense of the Pines Bushland and wildlife corridors, against the Frankston Freeway for years now, may have taken her final physical stand on this on the battlefield at Westerfield, where she has been manning a picket-line since Monday 5 July 2010. I doubt, however, that we have heard Gillian's last word on this matter, because as she went down, she was brandishing papers and talking barristers. Here is news from the front concerning the threatened destruction of historic Westerfield with construction of Peninsula Link (Frankston Bypass). As reported earlier. on Thursday 23 September 2010 Roads Minister Tim Pallas gave an undertaking that work would be suspended until after a VCAT appeal had been heard. The AbiGroup and its sub-contractors are apparently not working on the property today, Monday, because they have an agreement with CFMEU to honor their "lock down" week-end. Gillian Collins says that if the AbiGroup and Linking Melbourne authority do not comply with Minister Pallas' decision to suspend the work until the VCAT appeal has been heard, then we will need to show up in force at Westerfield on Tuesday - tomorrow - to continue to make our case. So the message is - prepare to come to Westerfield tomorrow early if possible. Check later today on www.savethepines.net. This will have current information. Gillian suggests that if there is to be a picket tomorrow coming to the Westerfield house parking lot and then walking down to the picket line. Hundreds of people have visited the picket over the past months. The community support is very much appreciated. Police informed Gillian and site manager confirmed that no trees will be cut down today. Site fences will be built. It was a long day today - but what a day! About 60 protestors came to our community picket today and stopped the bulldozers. We owe you such a great debt of gratitude. As Shakespeare's Richard V said in a very loose modern translation - you should have been there! I am in awe of the courage shown by our faithful band, and by the exceptional work and support shown by the two CFMEU organisers who came to help. Thanks to them and some great mediation by the Frankston Police, we have a short reprieve until 7:00am Thursday morning. 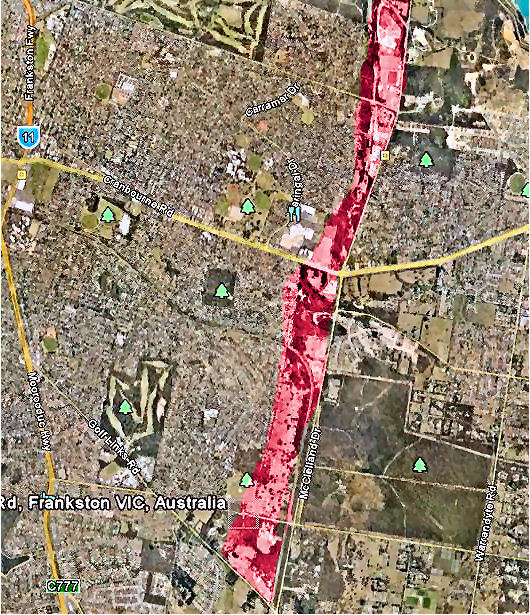 Between now and then the Pines Protectors under the auspices of the Frankston North Community Group, Inc. will be filing a case with VCAT to stop the contractor until offsets required by the Native Vegetation Framework are secured. We will also continue to work with the CFMEU and the contractor to get more time. If we can't stop the contractor from continuing, the bush will be destroyed on Thursday. We saw enough raw power in their three PC300 excavators and a bulldozer today to destroy Westerfield's in a day - a terrifying thought. Some of us will still be there trying to stop them on Thursday. We would welcome your companionship and participation as we face this real life terror. "Protest co-ordinator Gillian Collins said the group would go to the planning tribunal today to see if there were legal avenues to stop demolition. If the group is successful, the case could become the first test of state legislation put in place last year to stop last-minute legal objections delaying big transport projects. Ms Collins said police had informed the protesters they would be arrested on Thursday morning if they remained. Abigroup spokeswoman Carol Bartley said yesterday work had been put on hold until Thursday morning." Source: Clay Lucas, "Protesters fight to delay Frankston Bypass work," The Age, September 22, 2010. Gillian Collins, who has led the defense of the Pines Bushland and wildlife corridors, against the Frankston Freeway for years now, may have taken her final physical stand on this today, September 21, 2010, at Westerfield, where she has been manning a picket-line since Monday 5 July 2010F. The freeway is the work of SEITA and the Victorian Government, and this encounter was with Abbey Road Construction. I doubt, however, that we have heard Gillian's last word on this matter, because as she went down, she was brandishing papers and talking barristers. She continued to negotiate firmly right to the end with an Abbey Road Construction team, on behalf of the picketers, and all remained on site, to block the passage of the bulldozers in order to defend the wildlife and the trees. As the picketers stood their ground against several bulldozers, whilst awaiting the arrival of the police, other construction workers began to chainsaw trees at the other end of the property, where the picket-line had its marquee. An artist working there, Ceci Cairnes, who had been painting the trees and the tent, was alarmed to see the chainsaws arrive. "No-one even spoke to me. Not even to tell me to be careful. They just began sawing down trees." When I left only a few trees had been sawed down, here and there, as though the moonscapers didn't want their work to look too obvious right away. Perhaps they intended to finish it at night. A woman carrying one small animal cage - the kind you take a cat to the vet in, followed behind a small group of construction workers, which proceeded towards a large, beautiful dam, surrounded by luxuriant vegetation. As they disappeared among the foliage, I heard their chainsaws start up. My dog had been waiting for me in the car for a couple of hours, so I was anxious to take him walking. I consoled myself with the idea that there were still some areas between here and the Pines Reserve where we could walk off-leash for a kilometer or two without putting wildlife in danger. Heading for the area between Skye Road and the Pines, that runs parallel with McClelland Drive, I passed scenes of complete devastation. Next door to and opposite Peninsular Private Hospital, on the corner of McClelland and Cranbourne Road were moonscaped, with not a tree standing, but mounds of massacred vegetation with broken trunks and branches poking out, and hills of bare, drying earth. You could almost hear the silent screams - or perhaps they were my own - as the earth and the creatures in it died and released the carbon they had stored in their living bodies. There was industrial mowing along McClelland Drive. Bulldozer-like machines with long metal arms with lawnmowers on the end mowed the roadside vegetation on the left as they drove down the road. This was the first time I had seen such machines. I marvelled at their number, at the embodied energy in these monsters, and at the trouble engineers take to remove every last scrap of life from their projects. When I got to Skye Road, I reeled in horror, because the bushland on both sides was also now reduced to mute and damaged carcasses, bulldozed up to form a dark wall on the horizon. I saw that the actual tree-lined-track beside walled new suburbs that I usually took from Skye Road to the Pines had been spared, although everything between it and McClelland Drive had been blasted. Determined to console myself with this last remaining bit of green, I drove the car up to it and parked. My dog got out of the car eagerly, looking forward to running finally. All part of "the plan"? Alas, our way was barred. A grotesquely cheery blue sign announced on behalf of the Victorian Government that this was "all part of the plan!" Maybe body-snatchers have invaded our leaders in Victoria. That would explain their alien plans for the rest of us. Infuriated, I drove on to a road that leads to the golf course on McClelland Drive. Word was that they had done a deal with SEITA to have their course saved when parts of the adjacent Pines Wildlife reserve had been sacrificed. I thought that I should be able to get into the reserve with my dog, via the golf-course. I realised I would have to keep my dog on a leash, but it would be better than nothing. The entrance gates to the Pines Reserve adjacent to the golf course were covered in signs telling the public to keep out, but the gates were wide open, and Nubi and I had had enough. We walked through the gates, heading for the sand-hills in the distance. Alas, to the left and to the right were more scenes of devastation. The bulldozers had already been through here too, leaving only a few self-important little men in florescent parkas walking about with mobile phones a few hundred meters away. My gaze was arrested by a truck bed stacked with enormous logs. I had not thought that there were such large trees left in this area. For a moment I thought this must be part of an exhibit I had seen in the outdoor exhibition at the McClelland Gallery, but these logs were much larger. I wondered what would happen to them. At last I realised the extent of the Frankston Freeway: it was going to trash most of the bushland I had come to love in the 20 years since I moved into an old house here - no, not some new development. Below is my google-earth grab of what it looks like to me. The Victorian Government is at war with nature and the people who defend nature. It has been shown to flout its own laws on fauna protection. It presses the interest of property developers and passes laws to promote property development in the name of economic growth which it prioritises over all other things. It forces population growth on the people of Victoria and thus creates new pressures daily for our natural environment. We are not able to affect our government democratically on these issues because the opposition holds similar values to the government. The Victorian Greens won't criticise population growth or property development as priorities, only trying to minimise a harm which must eventually overwhelm all attempts to compensate for it or otherwise attenuate the damages it causes to our natural surroundings and the fauna which depend on them. The Victorian government licenses agents, such as Abbey Road Constructions, to carry out its will and expects the police to back up such corporate activities in the field. It thereby forcibly exerts its will against democratic objection. How should Citizens react to forcibly carried out undemocratic actions which they hate? Most of us cannot afford to access the formal legal system and there are few laws to defend the environment and fauna and flora which the public can actually make a complaint under. Usually those laws require another party - often a State Government agent or an NGO in receipt of government funding - to act on behalf of the public and bring a complaint, and this so rarely happens. In the absence of legal resources, for whatever reason - either by lack of money or lack of good laws, how should citizens react to force? They cannot afford to initiate force because the state holds the power and the means of savage repression. Citizens do, however, have the moral right to resist the state or its agents and contractors where they forcibly act against democratic objection and the spirit of laws to defend environmental and ecological values, for all kinds of reasons. The use of picket-lines represents a reasonable and defensible response where citizens use their bodies to resist the impacts of unreasonable government policies, whether carried out by a contractor or directly by government employees, in the opinion of this author. 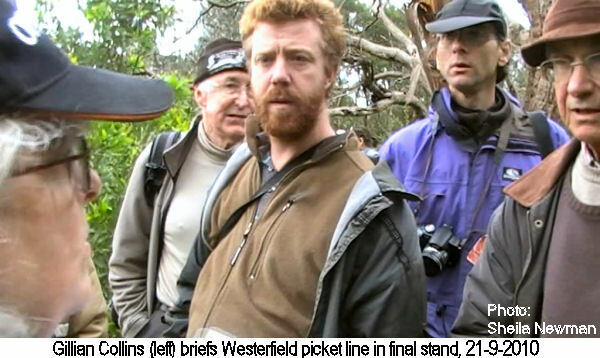 Gillian Collins and others on the Westerfield Picket line took a courageous and necessary step in the battle of Victorians to defend their right to protect and conserve their natural surroundings and the right of indigenous fauna to live in peace. They have not won this battle, but the war is still on and there must be more battles. Why can't the Vic Govt. be prosecuted for it's vandalism? Brumby and Co. are no better than environmental vandals - their green credentials are a joke. All they care about is scarring the landscape with more freeways. If the protesters similarly vandalized the demolition equipment in order to stop it vandalizing of our bush they would almost certainly be prosecuted. So, why can't the Government be prosecuted for it's vandalism? Our Brumby government must be the most environmentally destructive and contemptuous one in recent history! How can they justify this environmental destruction, and destroying native wildlife habitat or killing native animals, despite all the threats to their survival they are trying to overcome. A Victorian Naturally Alliance study shows that we are in danger of losing some of our most "common" native birds, due to loss and fragmented habitats. Our reserve system just isn't enough to protect them. How long are they going to keep pretending that everything they do is "sustainable" when it clearly isn't? Our democratic rights are being denied and bulldozed like these heritage areas - all for more urban sprawl. Once humans overshoot their environmental limits, the costs are painful and destructive! At a time of extinctions, it is simply heavy-handed vandalism so that more developers can gain profits from continued urban sprawl in the Peninsula region. I have been dreading this for months.... or is it years? The events of today have been brought about by an evil force that knows no bounds. The sign "It's all part of the plan" is utterly sinister in the context. The lyrical painting is a poignant record of a human response to a particular piece of natural beauty. When all the incidental areas of nature that ordinary people can come across easily in their travels and enjoy are gone we will no longer know how to respond to nature. As one of the ones standing in front of the bulldozers yesterday I would like to add that not only does Abigroup and its employees have no regard for nature, they have no regard for human life. Their actions were insanely reckless and broke every OH&S rule in the book. I hope the many videos taken yesterday (including by a guy who called himself a channel nine stringer) will be made available for viewing somewhere. Good to hear from you. We would appreciate pictures of what you describe being sent to james@candobetter.org - if you want to amplify their impact. We can also send them on to someone who will send them round further. We hope that someone will be filming tomorrow (Thursday 23 Sep 2010) when the bulldozers and police may come together. We must hold to account at the coming Victorian state elections the politicians responsible for the vandalism at Westfield. Unfortunately, it won't be as straightforward as voting out this reprehensible Labor Government and voting in the opposition Liberal and National Parties, as the policies of the latter are virtually indistinguishable from the former. This is in spite of the fact the latter will often exploit such situations to score cheap points at the expense of the former. This means opponents of the Westfield vandalism who want to save the remnants of bushland in this region need to either consider vocally supporting candidates from some other party or standing as candidates themselves. Preferences on a two-party-preferred basis should be given to the least worst of the two major parties, that is, if it is possible to decide that either can be designated thus. In spite of the Greens' limitations and overall timidity, if no other better candidates stand, then at least give your first preference to them. At least a high vote for the Greens will most likely be interpreted as a vote against environmental destruction. Even if such third party candidates are not successful and even if they fail to attract a high vote at the coming state elections, it is still vastly preferable that such candidates stand than not stand. Not to stand leaves unchallenged the right of Victoria's current Government to continue to misrule this state against the interests of the majority and in the interests of the selfish greedy elite which stands to gain from the vandalism at Westfield. More than ever, voters are in the invidious position of deciding who to put last on their ballot papers in order to choose the lesser of 2 evils to assume government . This time in the Victorian election I know the temptation for many, particularly those who are tuned into the environment and planning issues which are monopolizing people's energy and lives is to avoid this uncomfortable dilemma by voting informally. Would optional preferential voting give a result which better reflected the people's wishes than compulsory full preferential voting ? Is it worth lobbying for? I favour optional preferential voting over the standard preferential voting system, where voters have to number every square. However I wouldn't devote a great deal of resources towards lobbying for it. Those resources would probably be better spent campaigning for votes in the existing preferential system used by most Australian voters. Whilst I think that optional preferential voting is a fairer system, in practice it can lead to results that are less reflective of peoples' wills than full preferential voting. This is because many voters are uninformed or even misinformed about the preferential system. When candidates recommend to voters in their "How to vote" cards that they don't allocate preferences beyond the first preference as the Greens have often done in Queensland state elections where the optional preferential voting system is used, they are effectively recommending that they vote "first past the post". If that candidate does not win, then the votes for that candidate, with no second or subsequent preferences can't be used to decide amongst the remaining candidates as happens with full preferential voting. Whilst people should not be made to give preferences, for example to a Nazi Party candidate, usually voters will have a preference amongst candidates not given their first preferences. The election outcome, where more preferences are allocated by voters, can be more truly representative of the voters' wishes than where voters have allocated less preferences as, for example those who would followed many of the Greens' "How to vote" cards in Queensland state elections would have. Whilst it could be considered more commendable for the Greens not to have directed their voters' second and subsequent preferences, to not have advised them on their "How to vote" cards that they could have if they had wished to was a disservice. The meaning of the ominous government sign pictured in this article about the Peninsular link project being part of "the plan" was more fully explicated yesterday when 100 police overpowered the protesters at the site which was then razed. There is no answer to the sheer physical force of 100 fully equipped police, some on horses and with whom no discourse was possible. It seems to me that an integral part of "the plan" is to crush any dissidents to despair and ultimately to disengagement. I was not at Westerfield yesterday but my comments here are based on a detailed first hand account of the day. If our Labor government wasn't so obsessed by property and land developers, and their profits, we would not have this problem of new freeways "needed" or the massive cost blowout of the desalination. These monstrosities will be monuments to our Victorian government's excesses and extravagance, at our expense. The Thompson Dam is massive and was built to "drought proof" Melbourne in 1983. This would still be the case, but we have leaders who make poor decisions and who think that we can have limitless population growth! Who pays for this growth? We do! Once we overshoot our natural limitations, including natural resources such as water, the costs of providing them artificially is very expensive - economically and environmentally! Water is an essential for life, not a privilege to pay such high costs. Once peak oil sets in and the cost of petrol rises, the destruction of this Frankston bypass will have been another ill-informed decision and the restoring the habitat loss and wildlife will become improbable. The Supreme Court found the Brumby government's VicForests guilty of illegally logging East Gippsland's Brown Mountain. Surely this is equally destructive vandalism? Brumby government vandalism a disgrace! Our Brumby government cares nothing for democracy, consultation, heritage values, community values, our wildlife, our environment, green wedges or the opinions of the public. They are all smoke and mirrors and only care about property developers and making access easier so we can have a bigger Melbourne - Melbourne@5 million! 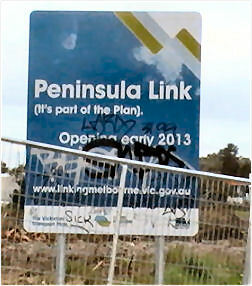 This is what the Peninsula Link is about, access to the Peninsula for more of Melbourne's toxic urban sprawl! Population growth is Victoria's main industry now, and the most destructive one ever. As I said above, this has to be made an issue at the Victorian State elections that are to be held in November. If community grass roots mass movements can't use the elections to hold to account political representatives who are supposedly working in our best interest and who are supposedly accountable to us, then how can we legally hope to end this wanton destruction of our little remaining bushland? Not one of the politicians would stand any chance of defending their destructive actions, if faced with articulate defenders of the bush in a public forum. These should be part of most elections in Australia. In effect any candidate can force other candidates to attend public forums during an election campaign because to refuse to debate reflects badly on a candidate. Unless opponents of this vandalism stand as candidates, this opportunity will be lost. Copyright may differ amongst site authors. Please check copyright notices of individual authors.